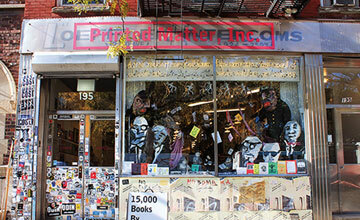 Vanity Fair called it “the CBGB of Indie Bookstores,” but Printed Matter, located at 195 Tenth Avenue, is much more than that. 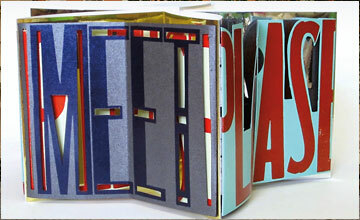 Founded in 1976, the non-profit organization is dedicated to the dissemination, understanding, and appreciation of artists’ books. The shop carries contemporary artists’ books, zines, posters, prints, multiples, and a broad selection of out-of-print material. In addition to programs and exhibits on site, PM has also organized the annual NY Art Book Fair and the LA Art Book Fair. For more information, visit printedmatter.org. Located at 28 W. 27th Street, 3rd floor, the Center for Book Arts offers all manner of bookbinding and printing classes and gallery events. The first week of April is reserved for its annual auction and benefit on April 10 at 6 pm. This year’s honorees are Béatrice Coron, artist; Mark Dimunation, chief of rare books & special collections at the Library of Congress; and Sue Gosin, founder of Dieu Donné Papermill. Seen above is one of 2013 CBA artist-in-residence Cecile Chong’s letterpress-printed carousel books. For more information, visit centerforbookarts.org. Courtesy of the Center for Book Arts. At 209-211 Water St., this “dos-à-dos” establishment is a hidden jewel. Here you can experience the traditional craft of nineteenth-century letterpress in a charmingly atmospheric shop true to its origins (Bowne & Co. is Manhattan’s oldest existing business under the same name). Part museum and part shop, it expanded in 2012 to better use the museum’s working collection of printing presses and hundreds of fonts of moveable type. Whether you try your hand at printing or simply browse the shop’s handcrafted wares, you will not be disappointed. Open every day, 11 am-7 pm. 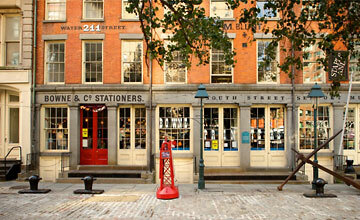 For more information, visit southstreetseaportmuseum.org. Courtesy of Tyler Orehek Photography. Booklyn is an artist-run non-profit that promotes artists’ books as art. There are exhibitions, events, workshops, and lectures, as well as a portal to buy unique and editioned books, zines, and letterpress productions. Open house ‘salon’ hours in the Brooklyn gallery at 37 Greenpoint Ave., 4th floor, will be held during Rare Book Week. 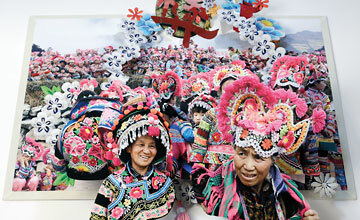 Seen above is Colette Fu’s Yi Costume Festival, a digital photo pop-up book about the Yi tribe of China (2013). For more information, visit booklyn.org.